There are two different lenses through which a wall can be viewed: the eyes of a drywall ﬁnisher, and observations by everyone else. It’s always fascinating to me how little people know about the various mediums inherent in the drywall industry. We’re surrounded by walls our entire lives, yet we pay little or no attention to how they were created. Yet often, we tell each other that we hate the texture in our homes and wish there were a way to improve them. To begin with, we need to address the mediums. Many people refer to drywall mud as “spackle.” If you’re not in the trade (or even if you are) don’t ever call drywall mud “spackle.” This will only succeed in establishing you as an ignoramus, and you’ll immediately be discredited by the tradesmen in the ﬁeld. Much like the art world, the drywall industry is comprised of different mediums and those mediums are designed for different purposes. Plaster is both a medium and a trade. Drywall and plaster are two completely different trades of the construction industry, but both will be addressed here because they both pertain to the topic of smooth. For the purpose of this article, all you need to know is that plaster is a specialized wall ﬁnish and is at no time used in the drywall industry. In turn, drywall mud, is never, or rarely, used in the plaster industry. These elements of wall ﬁnish are so completely different that they have their own speciﬁc trade unions. So next time you’re in someone’s home, and you say, “I just love the plaster on these walls!” be careful you’re not referring to their textured drywall. Plaster and joint compound are two different mediums and should be addressed separately — always. Smooth ﬁnish is not really smooth. Oh wait! We’re not there yet! That’s right, I was going to talk about smooth ﬁnish. Thanks for being patient. Now that we have a minimal understanding of the mediums/trades, I guess we can talk about how those guys and gals make walls smooth… or not. As deﬁned by the USG Drywall Industry Standards, the levels of drywall ﬁnish are broken down into 5 numbers. We’re just talking about drywall here and not plaster. We’re not talking about texture either. We’re just talking about getting the wall ready for texture. Imagine you have a freshly hung piece of Sheetrock. Every seam where the Sheetrock attaches to the wall stud needs to be ﬁlled and covered with drywall tape and joint compound. This is the drywall ﬁnisher’s job: to make the wall appear ﬂat (even though it actually isn’t) for future texture or smooth ﬁnish — and eventually paint. The levels of ﬁnish as deﬁned by the industry are basically the ﬁnishing steps involved in creating a ﬂat wall. I’m giving each my own deﬁnition so you won’t have to read the boring USG version. You’re welcome. Level 1. – Tape the joint and don’t wipe out the excess mud. If you only ran this ﬁnish on your new home, then it would look atrocious and your neighbors would look at you funny. This is a minimal ﬁnish, often used in mechanical rooms for ﬁre prevention. A smart general contractor, to save money, might attempt this level before calling a professional. Level 2. – Tape joint, wipe mud ﬂat, spot screws/nails once. Drywall is fashioned to the stud with drywall nails and screws. On a level-two ﬁnish, those screw heads are spotted with mud once to ﬂatten out the dimple they’ve made. The extra mud on the tape, seams, and angles are ran ﬂat and clean. Corner beads are applied to outside corners, and excess mud is cleaned away. Some General Contractors will attempt to achieve this level. If you are this person, be prepared to pay extra when you have to hire a drywaller to ﬁx the failing surface. Level 3. – All joints and interior angles should have tape embedded in joint compound and should be immediately wiped with a joint knife or trowel, leaving a thin coating of joint compound over all joints and interior angles. Now we’re starting to get it pretty ﬂat. Still, if you textured and painted over this ﬁnish you’d see all the drywall blemishes. This ﬁnish is what I affectionately refer to as, “contractor grade” because this is about as ﬂat as a non-professional can make it. That’s being generous. Level 4. – Requires a professional drywall ﬁnisher. All drywall butts, bands, and corner beads are taped and ﬂoated with at least two coats of joint compound. All fashioner dimples have three coats, and all inside angles are taped and ﬂoated once. With a level 4, you had better sand down your edges (even if they’re perfect) and give those pesky butts some extra love because your wall needs to be ready for a very little texture and a crappy paint job. A normal level 4 ﬁnish is considered level 5 smooth wall if you’re anywhere in the southwestern United States. A general contractor will expect this level of ﬁnish on every job weather their paying for it or not. Level 5. – Level 5 is the crème de la crème of drywall ﬁnishes. It is the very smoothest of all the drywall ﬁnishes and should only be attempted by a true professional. Achieving a level 5 smooth ﬁnish is the equivalent of mastery in the trade. The term “Smooth Finish” gets tossed around loosely. Most laymen cannot comprehend the level of knowledge and skill it requires to accomplish a true level 5 smooth wall and thus, have diminished the term from what it actually is. Level 5 smooth ﬁnish has a built in “lore” component that’s been passed down through generations, and although there are many different ways to achieve a level 5, no one particular way is the right way. For most who learn how, they’ve had a very competent teacher. If you’re lucky enough to have had a master bestow this knowledge upon you, then consider yourself a member of an exclusive club. I know very few adept Masters personally, but if you go on the Facebook group “Drywallers Worldwide” you’ll ﬁnd some there. While working in the union in Portland, Oregon, I was trained under some amazing journeymen, and after many years of experience, I consider myself an expert in these aspects of drywall. I have a good eye for quality ﬁnish work, but the only place I’ve seen a true level 5 ﬁnish was in Portland, Oregon. Bottom line: a level 5 ﬁnish, although elusive, if done properly, looks amazing. It is just very time- consuming, requires great skill, and is extremely costly. No matter which trade you’ve been acquainted with, there’s a common theme, and that theme is that “smoother is ALWAYS better.” I’ve had limited experience with plaster, but of the experience I’ve had, I remember the extreme difﬁculty the most. Although plaster is laborious, expensive and time consuming, the results can be amazing. In both the drywall and plaster applications, there’s a huge amount of energy involved to create a smooth ﬁnish. Also, in both applications, the predominant idea is a perfectly smooth wall. With Fresco Harmony the focus is more on affordability and efﬁciency. I get it. For some reason smooth walls cater to a calmness that is just not felt with a textured wall. Fresco Harmony is challenging how smooth a wall needs to be, but still look classy and cool. When people ask me if Fresco Harmony is smooth, I tell them that it is. Set aside my deﬁnition of true level 5; Fresco Harmony may not be perfectly ﬂat, but it is smooth to the touch. It’s also smooth in appearance. More importantly, that smooth element is achieved with less effort, and the material cost is affordable. Everyone wants a nice smooth plaster look, but few are willing to pay the high prices. What’s the alternative? Ugly texture and paint? Gone are the days of laborious sanding and expensive materials to achieve a beautiful ﬁnish. Even hand-textured surfaces are more appealing than spray texture and those take a lot of work. If you’re hand texturing anyway, why not throw color into the mud and create a timeless ﬁnish your clients will love? 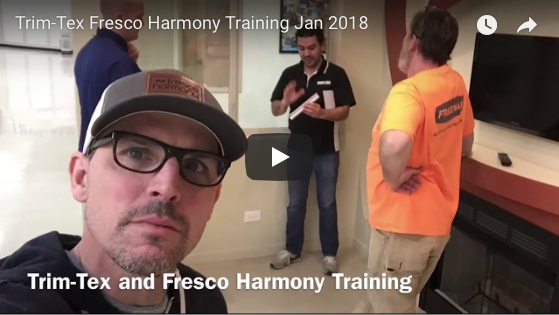 The Fresco Harmony model is challenging the way we view ﬁnishing drywall. Now it’s possible to exchange the traditional level 4 (sand, texture and paint method) with the Fresco Harmony, no sanding, method and deliver a ﬁnish that’s both efﬁcient and beautiful. Fresco harmony is the nations first color line specifically designed for joint compound.check out some of our videos. Fesco harmony on YouTube. Love the article, Nick. Very good explaination, and insight.